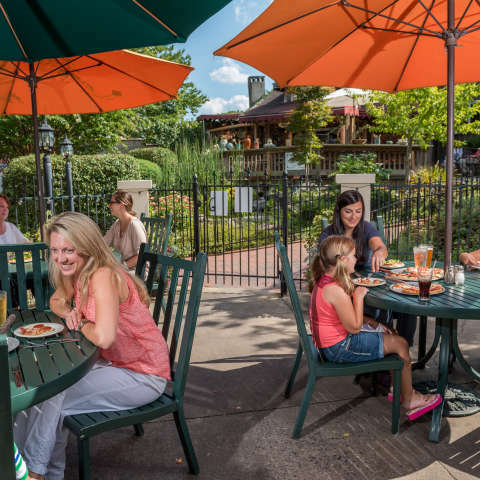 Rolling mountains serve as the backdrop to this vibrant mountain town, boasting a lively downtown filled with craft galleries and quaint bistros—just 25 minutes from Asheville. 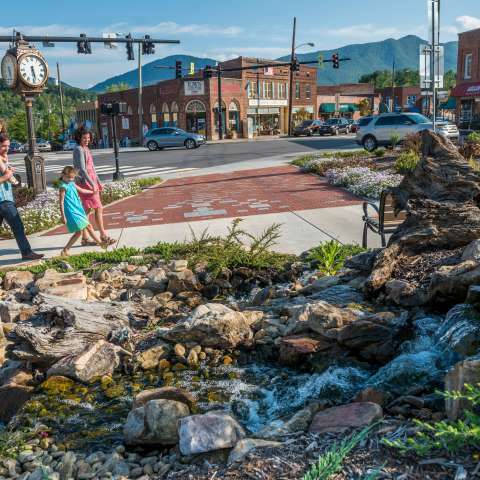 Black Mountain, located 15 miles from Asheville on the eastern edge of Buncombe County, is a quintessential small town, complete with a charming and walkable downtown, a thriving arts and crafts scene, and—at 2,405 feet in elevation—access to incredible outdoor adventure. Named for a mountain range that towers over the town, Black Mountain became a haven for pioneers in the world of art, painting, music, poetry, and architectural design during the mid-twentieth century. 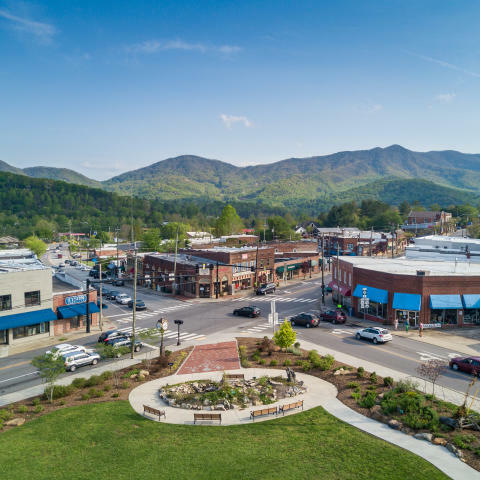 The town was once home to Black Mountain College, one of the most highly-respected and innovative experimental art colleges in the U.S. Today it remains an artist mecca with multiple galleries showcasing some of the region’s best southern Appalachian arts and crafts. 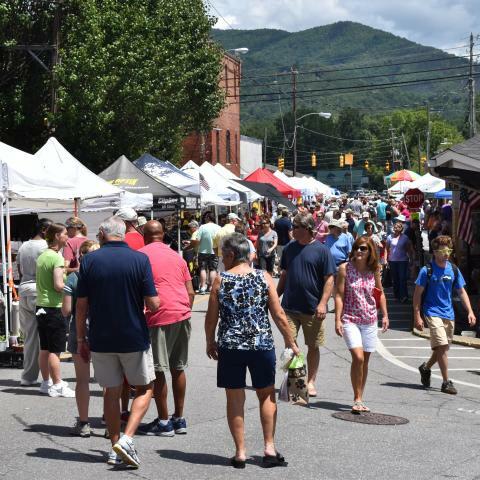 Visitors will find plenty of things to do in Black Mountain. Downtown streets are lined with independent shops, restaurants, art galleries, artisan eats, music halls, and breweries. The typically mild weather Black Mountain enjoys, even in the winter, provides year-round access to numerous hiking and biking trails throughout the area. There’s a wide range of places to stay, allowing you to choose the type of vacation best for you. Options include beautifully renovated Victorian Inns, quaint bed and breakfasts, and modern hotels. You can also find cabin and home rentals available. Stop in at the Black Mountain Visitor Center for maps and area information as you begin your exploration of town. Visitors planning a day trip or an overnight visit can find parking along the downtown streets, especially on Sutton Avenue. Other options include the Town Hall parking lot, a public lot on the south side of the railroad tracks, and when church is not in session, the Black Mountain Baptist and Black Mountain Presbyterian church lots. Black Mountain invites you to choose your own adventure. Take in the natural beauty by relaxing in one of the many rocking chairs around town, or climb the peaks where adventurers are rewarded with breathtaking vistas and fresh mountain air. 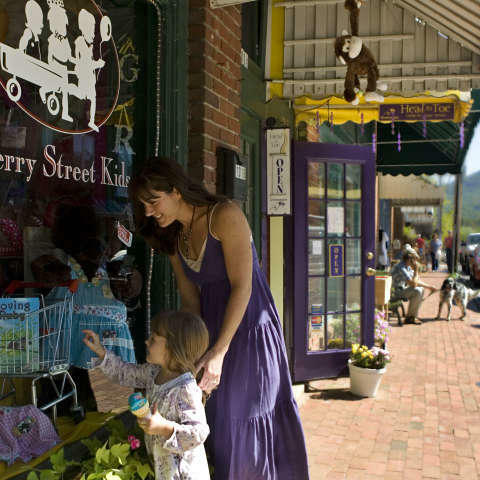 No matter which way you choose to experience this small town, you’ll quickly come to understand how Black Mountain’s charm has lured travelers to its doorstep for over a century. The land that now includes Black Mountain was once home to the Cherokee. Following the Revolutionary War, Col. Samuel Winslow Davidson was among those who founded the town, which was originally established as Gray Eagle in 1812. Thanks to its location on a natural route for pioneers headed west, Black Mountain flourished in the years following. The town received notoriety as the location of Black Mountain College, one of the most highly-respected and innovative experimental art colleges in the U.S. John Andrew Rice Jr. founded the college in 1933 based on the progressive idea that the arts should be at the center of a liberal arts education. Scientist Albert Einstein was among the distinguished leaders who served on the Black Mountain College Board of Directors, and resident and visiting instructors included the likes of Buckminster Fuller, Merce Cunningham and John Cage. The college shut down in 1957 due to funding issues but its arts legacy lives on today throughout the area, including the Black Mountain College Museum and Art Center in downtown Asheville. 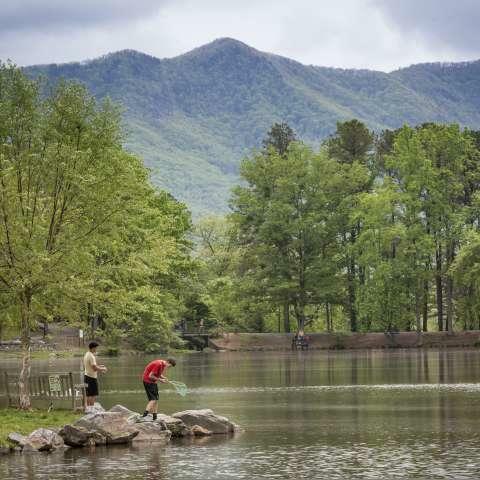 Black Mountain is also the hometown of GRAMMY-award winning singer Roberta Flack and was once home to Raphael Guastavino, a renowned Spanish architect who worked on Biltmore and designed Asheville&apos;s Saint Lawrence Basilica.